STRAWBERRY AND CREAM. Fresh ripe strawberry fragrance on a sweet vanilla and cream base. A rich smooth coffee aroma with notes of vanilla. IRISH CREAM. Choose from the fragrances below. Never leave a burning candle unattended. You will receive 1 pack of 10 individual Snow Fairy Wax Melts all of which are hand poured and unique in their own way. All our melts are highly scented and long lasting to bring freshness to you home. Made with 100% Natural Soy Wax, they last longer and are more Eco friendly than traditional paraffin wax. We aim to provide a balance of unique and traditional scents, all of which are selected by popular demand. We are continually adding new fragrances to our range. As seen on Instagram and Facebook. Other Fragrances Available Are: Vanilla Frost Lavender Alien Flowerbomb Spicebomb Red Rose Sauvage Snow Fairy Mulled Pear & Cranberry Amber Lily Citrus Bloom Coconut Milk Black Pomegranate Cupcake Black Opium Lady Million. Made with 100% Natural Soy Wax, they last longer and are more Eco friendly than traditional paraffin wax. Vanilla Frost. We aim to provide a balance of unique and traditional scents, all of which are selected by popular demand. 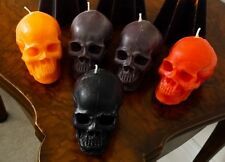 You will receive 1 pack of 10 individual Black Opium Wax Melts all of which a hand poured and unique in their own way. All our melts are highly scented and long lasting to bring freshness to you home. Made with 100% Natural Soy Wax, they last longer and are more Eco friendly than traditional paraffin wax. We aim to provide a balance of unique and traditional scents, all of which are selected by popular demand. We are continually adding new fragrances to our range. As seen on Instagram and Facebook Other Fragrances Available Are: Vanilla Frost Lavender Alien Summer Orchid Gentleman's Club Red Rose Sauvage Snow Fairy Mulled Pear & Cranberry Amber Lily Citrus Bloom Coconut Milk Black Pomegranate Cupcake. STRAWBERRY AND CREAM. Fresh ripe strawberry fragrance on a sweet vanilla and cream base. A rich smooth coffee aroma with notes of vanilla. IRISH CREAM. Choose from one of the fragrances below. Never leave a burning candle unattended. Here we have 4 scents Inspired by the Lenor Unstoppables range. Once the fragrance has all gone or you just simply wait for the wax to cool down. Each box contains 3 of each scent with a fabulous glitter finish! STRAWBERRY AND CREAM. Fresh ripe strawberry fragrance on a sweet vanilla and cream base. ADD 2 TO THE BASKET AND RECEIVE 3 (150 MINI HEARTS FOR THE PRICE OF 100). A rich smooth coffee aroma with notes of vanilla. You will receive 1 pack of 10 individual La Vie Est Belle Wax Melts all of which are hand poured and unique in their own way. All our melts are highly scented and long lasting to bring freshness to you home. Made with 100% Natural Soy Wax, they last longer and are more Eco friendly than traditional paraffin wax. We aim to provide a balance of unique and traditional scents, all of which are selected by popular demand. We are continually adding new fragrances to our range. As seen on Instagram and Facebook. Other Fragrances Available Are: Vanilla Frost Lavender Alien Flowerbomb Spicebomb Red Rose Sauvage Snow Fairy Mulled Pear & Cranberry Amber Lily Citrus Bloom Coconut Milk Black Pomegranate Cupcake Black Opium Lady Million. They will be made up of a various mix of all of our fragrances. STRAWBERRY AND CREAM. 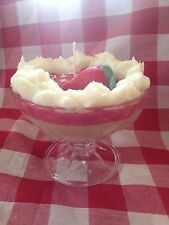 Fresh ripe strawberry fragrance on a sweet vanilla and cream base. ADD 2 TO THE BASKET AND RECEIVE AN EXTRA 100 MINI HEARTS FREE. FRESH LINEN. We only ever use natural eco soy wax for the best long lasting scent throw. ZOFLORA LINEN FRESH. ZOFLORA FRESH LINEN. Just 29 Pence Each. Colour WHITE. ZOFLORA BLUEBELL WOODS. You will receive 1 pack of 10 individual Vanilla Frost Wax Melts all of which are hand poured and unique in their own way. 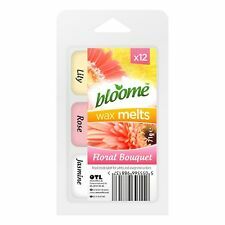 All our melts are highly scented and long lasting to bring freshness to you home. Made with 100% Natural Soy Wax, they last longer and are more Eco friendly than traditional paraffin wax. We aim to provide a balance of unique and traditional scents, all of which are selected by popular demand. We are continually adding new fragrances to our range. As seen on facebook & Instagram - Head over to bonnbella for our full list of fragrances & Enjoy 15% off! Other Fragrances Available Are: Vanilla Frost Lavender Alien Summer Orchid Gentleman's Club Red Rose Sauvage Snow Fairy Mulled Pear & Cranberry Amber Lily Citrus Bloom Coconut Milk Black Pomegranate Cupcake. You will receive 1 pack of 10 individual Sauvage Wax Melts all of which are hand poured and unique in their own way. 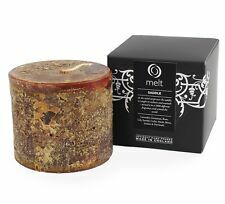 All our melts are highly scented and long lasting to bring freshness to you home. Made with 100% Natural Soy Wax, they last longer and are more Eco friendly than traditional paraffin wax. We aim to provide a balance of unique and traditional scents, all of which are selected by popular demand. We are continually adding new fragrances to our range. As seen on Instagram and Facebook. Other Fragrances Available Are: Vanilla Frost Lavender Alien Flowerbomb Spicebomb Red Rose Sauvage Snow Fairy Mulled Pear & Cranberry Amber Lily Citrus Bloom Coconut Milk Black Pomegranate Cupcake Black Opium Lady Million. 1 pk of 20 Handmade - SOY WAX MELTS FOR OIL BURNER SEVERAL FRAGRANCES TO CHOOSE! 1 x 20 Handmade SOY WAX MELTS -FOR OIL BURNER - SEVERAL FRAGRANCES! NEW SHAPES! Pk of 20 Handmade SOY WAX MELTS -FOR OIL BURNER - 40+ FRAGRANCES! NEW SHAPES!